I have put a lot of thought into everything I've used to decorate the master bedroom. 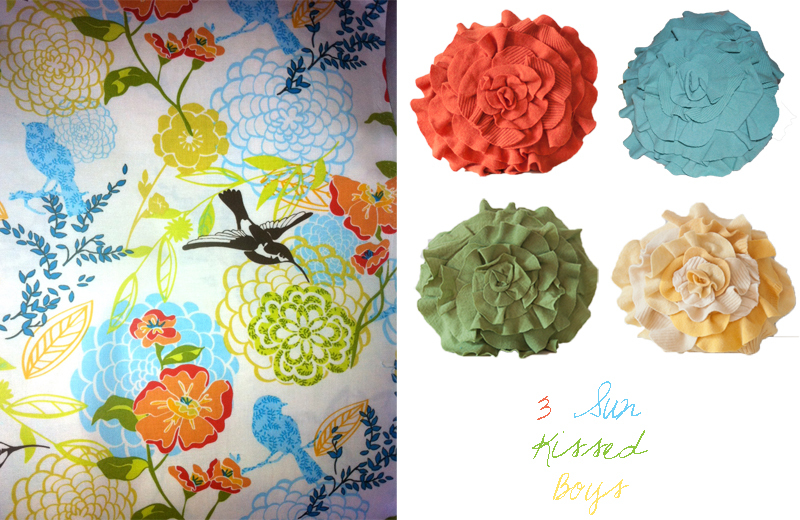 When I was looking for pillows for the master bed, I wanted to match the fabric I used to decoupage the dresser. However, I knew if I'd used the same fabric for a pillow, I'd tire of it quickly. So instead, I concentrated on solid color pillows pulling from the colors of the fabric. Etsy is a wonderful source for finding unique items because so many of it's stores sell handmade products. 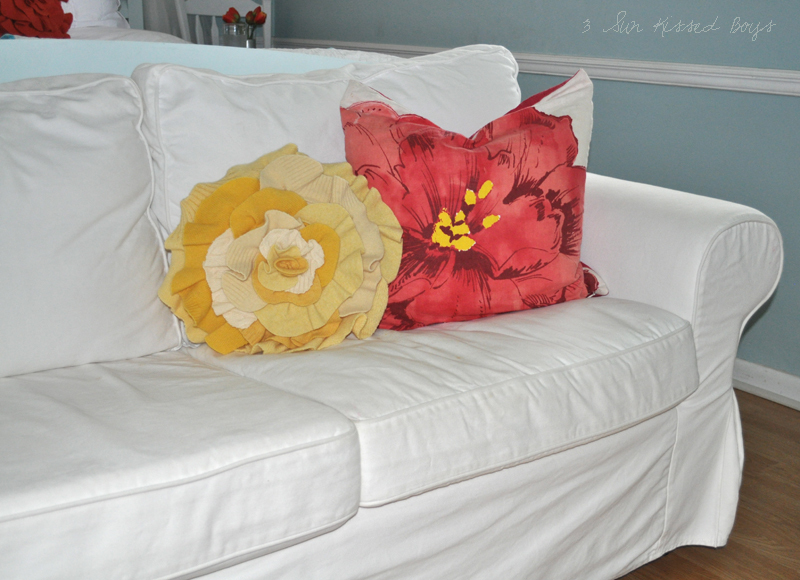 That's where I discovered That Funky Boutique and their selection of gorgeous and colorful rosette pillows. 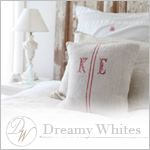 Angella Eisman is the mastermind behind these fun pillows and she was so great to work with. I sent her a photo of the fabric and she was gracious enough to put several cluster of pillows together, photograph them, and sent them to me so I could pick and choose from them. I had a hard time deciding so to spare Angie a headache, I went to her website. 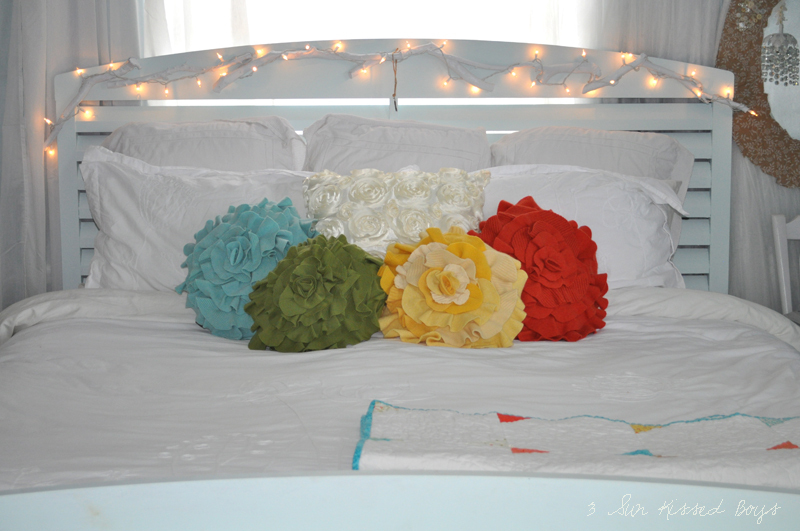 Since she has them sorted by colors, it was easy for me to "grab" the pillows and use Photoshop to help me visualize. 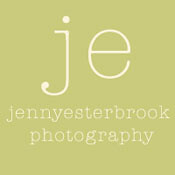 I am so happy with my color selection and the "real life" product! 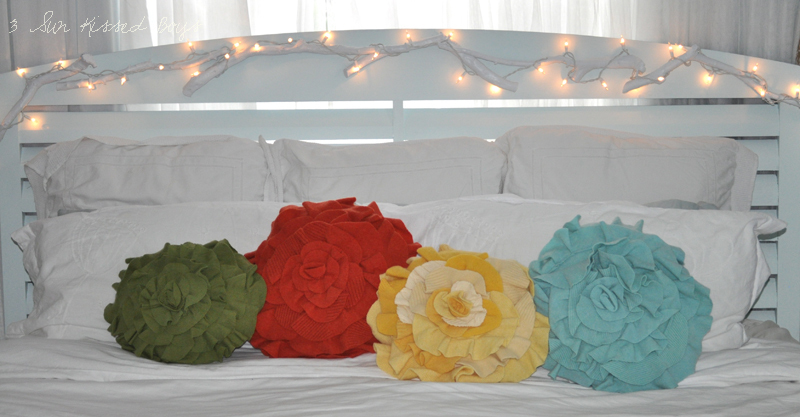 These rosette pillows are so pretty! ... or on it's own. They're beautiful! Don't you agree? Disclaimer: I was not compensated for this review. It's simply a product I liked and wanted to share. Those pillows are so cool. Thanks for sharing them! Those are adorable. I love the colors you chose. 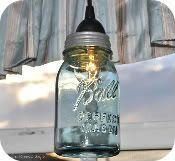 I have been thinking about making some! they look so cheerful and happy al clustered together! love them! Those are really cool. I love just looking around etsy when I have a second. There are so many neat things on there. They fabulous! Cute and colorful and HAPPY! Very cool! 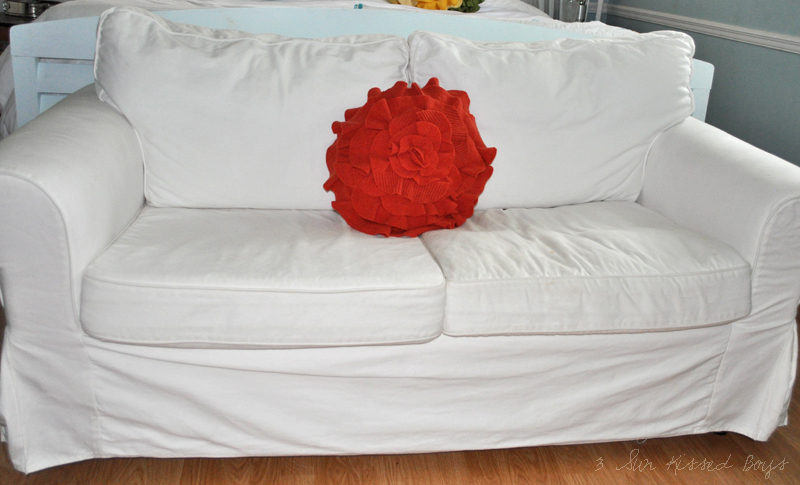 The pillows add a beautiful pop of color! 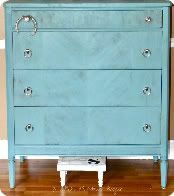 After we get around to painting the master bedroom, I may have to order a couple for my bed as well. You are very sweet to share them on your blog, Yanet! They look terrific in your room. It was wonderful working with you on them! Oh they are lovely. The quilt you've paired them with is so simple and striking. Fun.